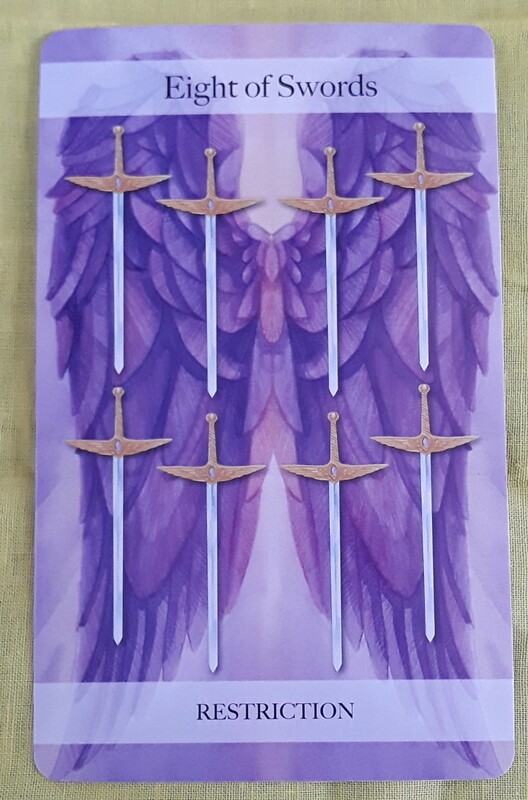 The Tarot card for today is the Eight of Swords (Restriction). Like yesterday, this could be a day where your mind could play tricks on you. In your calm moments, tell yourself to not let fear hold you back. Although the road ahead may seem difficult, once you take your first steps, you will see that the road is clear. 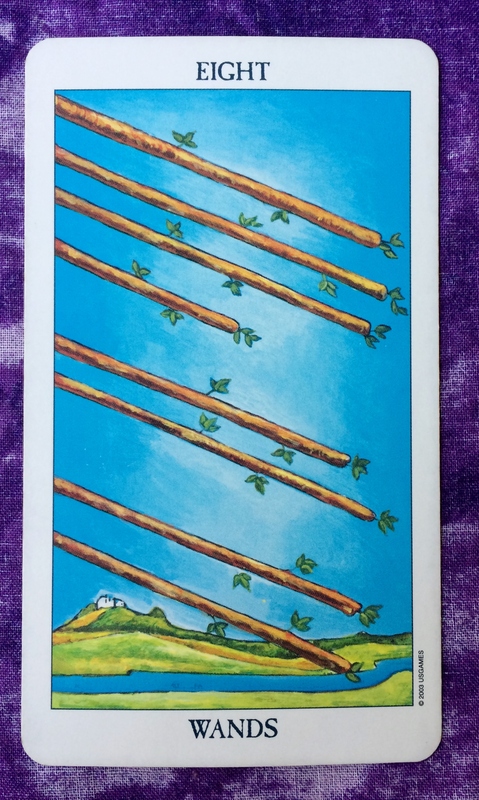 The Tarot card of the day is the Eight of Wands. There is a lot of energy flying around today. You may be quite busy tying up loose ends. You may finally decide to do the things that you have been procrastinating about. On the other hand, this could be a day when energy happens to you — meaning that things you have been waiting for suddenly happen. Try not to push too hard with all of this forward motion: You won’t have to. The momentum is already there. The Tarot card for today, Saturday, and Sunday is the Eight of Swords. As with all the cards drawn this week, the theme seems to be to not let fear stop you from doing what you need to do. There are challenges all around us in life, and sometimes it feels as if we can’t get past them. So while fear is necessary to keep us safe, let it be a guide to show us the way forward instead of a being a total roadblock. 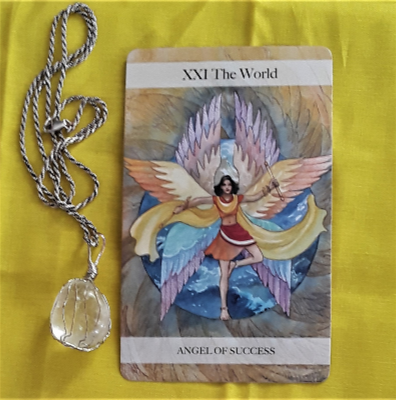 If you would like a personal email reading, take a look at the options available at my Etsy shop. The Tarot card of the day is the Eight of Swords. Don’t let fear hold you back. Fear is the subconscious mind trying to protect us from what we think is harmful. As a result, fear can become our comfort zone. The Eight of Swords shows that you can untie your hands, take off the blindfold, and step forward without getting cut by the tools of fear. If you follow astrology, you probably know that there currently are some challenging planetary aspects, including the Mercury retrograde (communication problems), the Aries sun square Saturn in Capricorn (anger issues), and the upcoming Libra full moon (a turning point for relationships). These events effect us as individuals but they also effect everyone collectively. It helps to be consciously aware of these aspects so that you will understand possible reasons for why you feel as you do and why things in your life are happening the way there are. Awareness also helps you figure out ways to get through these periods with a minimum of difficulty. The key is this: You don’t have to be perfect. If you lash out at someone in anger or if you fail to communicate properly, that’s life. It happens. Simply understand the motivation for the fear and channel the response in a way that benefits the greatest good for all. Comments are welcome! Have a great day. Hi, everybody. The Tarot card for today, Saturday, and Sunday is the Eight of Swords. When we have a lot going on in our lives, sometimes we let anxiety take over our thoughts. 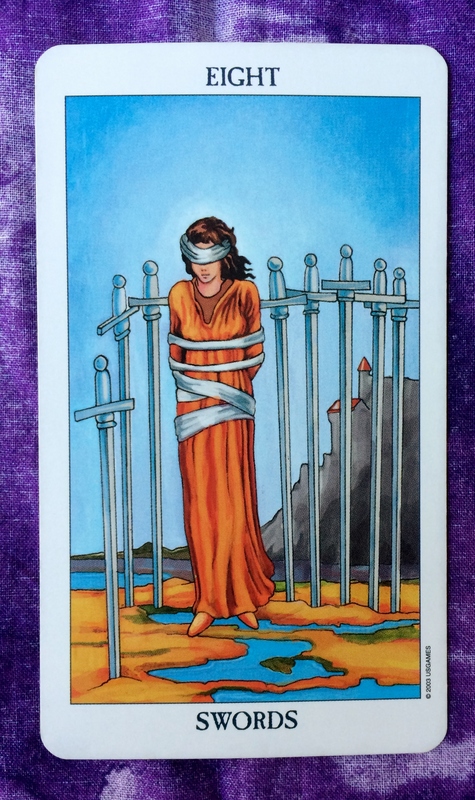 The Eight of Swords warns us against becoming a prisoner of our thoughts. Solutions to the challenges in your life are probably much easier than you allow yourself to believe. Part of the answer is to trust your instincts more — the part of you that does not necessarily rely on logic. Then, follow that path away from limitation and into a new sense of freedom. Comments are welcome. Have a wonderful weekend! The card for today, Saturday, and Sunday is the Eight of Swords. Your thoughts are telling you that you are trapped in a situation. You think you cannot take any action about it or else you will get hurt. But if you take off the blindfolds and open your eyes, you will see that you can easily handle things without getting hurt. Look at the situation objectively. Push past the fear. Take the first steps toward what you are afraid to do. With each step you take, you will gain the confidence to go all the way.